We scratch our heads. We don’t know what to get him for Christmas. He is a man who seems to “have it all.” He is rich and successful. What more could he want? When we talk about the rich and wealthy in America . . . and those who “have it all,” it is always someone else. Few think they are rich even when most of those in our country whom we call “poor” live with luxuries and conveniences that most of the rest of the world only dreams about. We do not want to think of ourselves as being rich and having it all, especially when Jesus talks like this in today’s Gospel. But what if being rich is not about our tax bracket? What if the rich are those with enough money. . . to be afraid to lose it? That puts Jesus’ comments into an entirely different context. Maybe being rich is not so much about size of our bank account but the size money in our lives. What is our attitude toward riches? If we have enough money to be afraid to lose it, then we are rich. Then we are partners with this rich man. 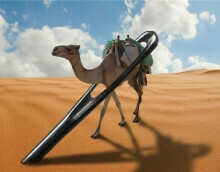 Then it is probably easier for a camel to go through the eye of a needle than it is for us to enter the kingdom of God. This passage is not going to be on the average Christian’s list of ten favorite Bible passages. We do not like to talk about money, especially in church. More than anything else in life, how we use our money reflects our deepest values and commitments. Look at how we spend our money, you will see our religion. No wonder Jesus talks so much about money. There is no more “religious” subject in life. Money is the measure of all things. We don’t need to talk about God and heaven and hell in order to talk about religion. “Show me the money” and I will show a man’s religion. We always have enough money for what really matters and what we truly value. If religion is what we fear losing more than anything else and what we love having more than anything else, then our check book says more about our religion than our prayers or going to church. In today’s Gospel, we meet a man who has got the money. He is not only rich, he is a guy who has it all. He is young and handsome, wears expensive suits . . . and goes to church every Sunday. He is the ancient version of Bill Gates and Billy Graham all rolled into one. He seems to be doing the right thing. He recognizes that money is not everything. He has come to the right place. It’s hard to knock someone who’s interested in Jesus. That is why Jesus’ reaction seems so strange. Jesus seems to put the guy down. Maybe Jesus is put off by the guy’s brazen attempt to flatter him. He has good reason for his confidence. He is rich. He lives in a good neighborhood and rides an expensive camel. He says his prayers. He goes to church. He is good at keeping the commandments. Jesus does not even call him on the carpet for fudging or cutting corners. After all, no one is perfect. This guy is good. This guy seems to have it all. But something is still not right. Jesus knows it and this man knows it. That is why he still nervously asks, “What MUST I DO?” To whatever his heart is clinging, it is not making him happy. Even with a long list of accomplishments, something is still missing. Jesus knows what must be done. Jesus touched a nerve. He punctured the balloon. The man could not let go. He could not trust Jesus more than his money. He may not have it all but he still has a lot. Now Jesus tells him to let go of it all as if it counts for nothing! The issue is not how much money is too much. This issue is not who is rich and who is not. The issue is this. We are all rich. It is not just that we keep clinging to our stuff. We keep clinging to our stuff because we keep wanting to remain in control. We keep trying to have it all. Jesus tells him what to do and he can’t do it. The disciples couldn’t do it. We can’t do it. This is impossible. Jesus is asking too much. No camel is ever going to slip through the eye of this needle. As long as we keep on insisting that “we gotta drive the bus,” neither will we. It is too scary to let go of the steering wheel and let God. How can we have it all if we have to give everything up? But . . . what is impossible for the rich man, for the astonished disciples and for us . . . is possible for God! That is the whole point of Jesus’ conversation. His faith did not go to waste. He did not stay stuck in the eye of the needle. He was raised from the dead. He passed through the eye of the needle. What was impossible for us was accomplished by Jesus. Jesus passed through the eye of the needle, through death, scarcity and shortage. Jesus let go and let God. He was not disappointed. He had it all even though, as he hung on the cross, it looked as though he had lost everything. In Jesus we meet the Kingdom of God. In Jesus Christ at last we meet someone and something we can trust. In Jesus we meet the God who simply gives us his love instead of demanding that we first have to prove ourselves worthy of it. In Jesus we have it all. At last we have a love we can count on. At last we can let go of our fears, embarrassments and shames. At last we can be generous and gracious no longer needing to stingily bite every nickel twice. At his table there is no rationing. At the font there is no statute of limitations. There is no eye of a needle through which God cannot pull us. Because we have it all, we can let go of everything. When we pass through the eye of the needle, life changes. It can no longer be business as usual. We begin to find ourselves doing strange and marvelous things. Not only do camels pass through the eyes of needles, but in a world where everyone wants to have it all, we start living as if we already have it all. The money everyone else jealously guards and carefully protects, we are willing to invest in those whom the world sees as dangerous risks. The marketplace demands, “Show me the money.” We give it away. Starbucks demands we must pay for our coffee. We live like we are at the drive-up window giving it away. We turn the other cheek, walk the extra mile and if someone asks for our shirt, we give them our coat as well. We are warned to guard our investments and watch our wallets. But here we make it a central part of our public worship. We insist on calling it an OFFERING and acting as if it is a privilege. Here it is a GET TO and not a GOTTA. No one needs to twist our arms or appeal to our self-interest. Here we actually give it away because Jesus has chosen us to follow him. This month we GET TO support the Campaign for the ELCA and give ourselves away to start new churches, train new leaders begin new initiatives to address world hunger. It is what you do when you already have it all. Here the impossible is possible . . . and camels pass through the eye of a needle.